So it is time to work on the upholstery. I had ordered a full upholstery kit from BAS last year. The only part of the kit that I have used so far was the front seat items. In that regard, I became frustrated last year with a stillborn attempt to fit the seat covers after a flurry of activity involving blasting and painting of the seat frames. Events overcame me and it turned out that a new job assignment had me flying out to work near San Luis Obispo CA, the home of XKs Unlimited, for a few months. I broke down the seat parts and shipped them to myself in CA. I took the components over to XKs and had their upholstery specialist, Carl, install the seat covers. He of course did a very nice job. This worked out well for me, as while I was in CA I was unable to accomplish any work on my restoration project. I had the seats shipped back to me along with my other possessions when I came back to North Carolina. They are still in storage, waiting for the time to install them. As a sidenote to my discussions with Carl, I asked him about schemes for getting the rest of the car upholstered, as the job can be and should be a little intimidating. Carl of course suggested that XKs would be glad to do the job! Due to the logistics of 2 cross country transits of the car, I rejected that idea. When I asked Carl about having a local upholsterer do the job he suggested anecdotally that he saw a lot of work come through that had been done by non Jaguar specialists that was poorly done and in for a redo at XKs. He strongly suggested I use a specialist on my side of the country. Well, I’m not faint of heart when starting something new, although I do find that it will take 5 times as long and there will be some moments of panic. Once again, I find that having my other 2+2 sitting a few feet away for perusal has proven to be a life saver in the regard of determining how things were supposed to be done. So here I go with the upholstery effort. One final note. 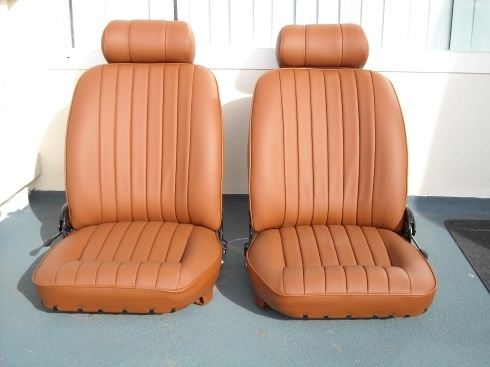 BAS also will upholster “shippable” items like the seats and the center console. I am sure they do a fine job. I did purchase the sunvisors from them already upholstered. The first item was the headliner. I had quite a bit to learn about headliner installation. Frankly, all of the upholstery work involves a fairly steep learning curve. And it is the type of work where your mistakes will show. So one has to do their homework and be meticulous in planning and execution. 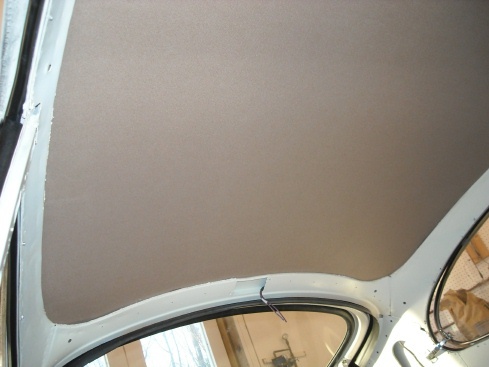 I found a few photos of headliner installations on the Jag Lovers forum, XKEData.com, and the Classic Jaguar site, among others. That said, good “how to” tutorials for the headliner and E-Type upholstery in general were hard to find on the web. I will post more detailed installation tips on my website as I go along but here are the basics. 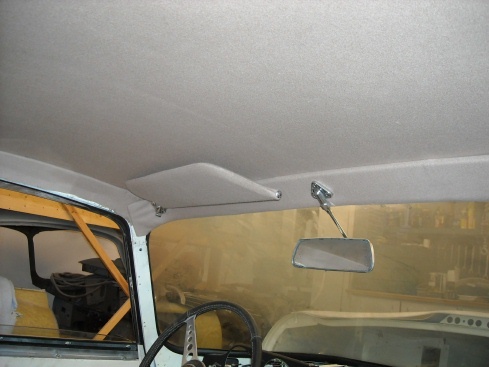 For my 1967 2+2, the headliner is a beige felt like material, not unlike the material that is used on pool tables. Of course, the underside of the roof is bare sheet steel. I had previously painted this surface with epoxy primer. The original installation features a thin layer of fiberglass material next to the steel. I had saved the piece that I took out. It is noxious material that after 40 years was decomposing badly. The thin fibers got into my fingers and my nostrils. It was definitely not something I wanted to re-use. Instead, I visited an upholstery shop in Raleigh, Auto Interiors and Tops, where I was able to source closed cell foam material in 1/8″ and 1/4″ thicknesses. They use it to rework exterior mounted vinyl tops on cars. 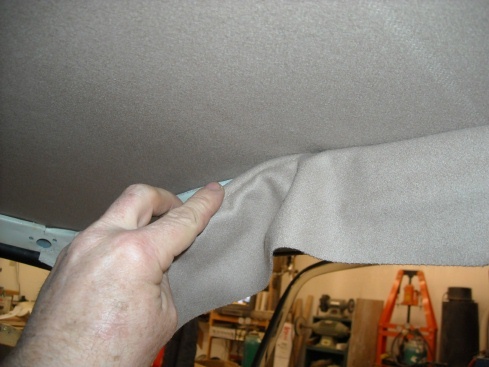 Closed cell foam is different from standard upholstery foam, in that there are no open voids. It suits the purpose of the headliner base perfectly. So now is a good time to talk about adhesives. The headliner is actually a tough test for your chosen adhesive. It has to hold up the full weight of the material and it has to be good in high heat situations. My research indicated that big box store contact cement would not hold up. More surprising, 3M spray upholstery adhesives are reported to not be up to the task. In addition, I wanted to be able to spray the adhesive out of a spray gun, like I have seen done on TV. 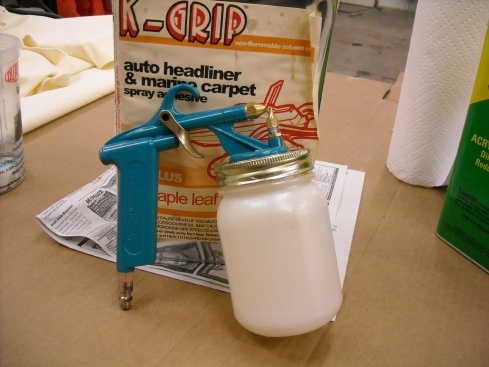 I contacted an upholstery supply house and they recommended K-Grip automotive and marine spray adhesive. Plus they sourced me a simple siphon action spray gun. With a little experimentation, I was able to obtain an acceptable spray pattern from the gun. Much easier than using a brush! The next step was to make a paper pattern of the overhead area. This can be transferred to the closed cell foam. If you go to the following web link, there is a short pictorial on the installation of the foam and the felt. The key trick is to install a string on the centerline of the roof, which allows you to hang the pre-glued foam and/or felt in rough position, making final alignment, and then you commit to placement. With contact adhesives you only have one shot! Once the foam and the felt are glued in place, the perimeter trim strips are next. On my car, there is a supplemental piece of sheet steel around the perimeter that provides a gap into which the perimeter strip is inserted. The perimeter trim strip comes prepped from BAS with an edge that is wrapped around a small, hollow rubber tube. Being hollow, the tube can be compressed and squeezed into the gap. Once inside, the tube expands and retains the trim material. The bottom edge of the trim material is glued to the sheet metal, below the line of the window surround trim strip. Across the front of the car, where the sun visors and the rear view mirror reside, there is a removable metal strip that can be trimmed on the workbench, installed, and held in place with screws. Whew! Headliner done, I could turn my sites a little lower in the car. Next month we’ll look at trimming out the rear compartment and hatch. « 43: On the Road Again!